Every morning just after sun-up, about three families of these White-tailed Deer (Odocoileus virginianus) sprint across my back yard. They have moved to a field behind the trees during the night to forage on the grass and leaves. Come daylight, they come back across the yard, cross the road and through a large church parking lot into a small wooded area where they spend the day. Usually I see them while I’m having the morning coffee and doing newspaper crossword puzzles, so I am not prepared to try to get any photos. Today I stood out in the finger numbing cold for about 45 minutes waiting for them to pose for me. They did not disappoint . I had trouble with lens fogging and image noise (due to high ISO setting), but at least I got a shot. In the last hundred years the White-tailed deer population has rebounded from near extinction to abundance, largely due to aggressive game management and the control of their natural predators (coyotes, mountain lions, etc…). 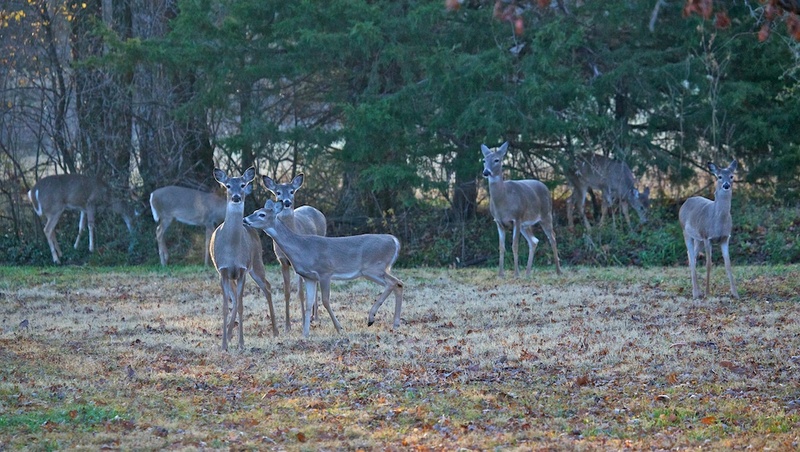 These particular deer, being in a suburban setting, have little to fear from the myriad of hunters around these parts. I may start naming them! I think there are enough to pull a Christmas Sleigh. I love the deer too! I used to feed them until it dawned on me I was fattening them up for the hunters…bummer!! Aw, keep on feeding Marsha. They can’t shoot em all. I’m thinking of putting out a salt lick for them, just as a condiment!